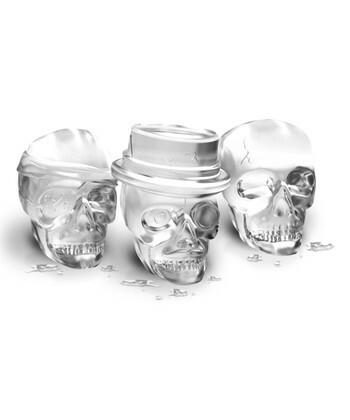 I got these Tovolo skull ice molds from Zulily. Haven't used them yet. These two at a sale! The mermaid skelly is totally worth it! Oriental Trading can be hit or miss, but this piece is definitely a hit! I agree, it looks great just as is if you're not a crafty person or don't have the time. And it's pretty big too. She got a lot of compliments & stares in my little pond last year. I didn't do anything to it but add a little hairband with hair (from Dollar Tree) & some cheap costume jewelry. I think I may add a bikini top this year. If you're crafty it's a great base to work from too. Corpsing, painting, whatever, I can't rave about it enough!! I only wish I needed more than one but alas, my little pond only has room for The Creature from the Black Lagoon & the mermaid. I would like to give her some hair as well, but I keep going back and forth. I'll probably wait until the last minute when she's up and surrounded by everything else. Then I'll know if it's needed or not. I'm thinking names of a Golden Girls type name. My great-grandmother was Maude & she had friends with equally Golden Girls-esque names like Blanche, Lois, Etta, Cornelia, Gladys, Bessie, Frances, etc.Those classic, turn-of-the-century type names that I actually like compared to some of the current weird or trendy celeb baby names.